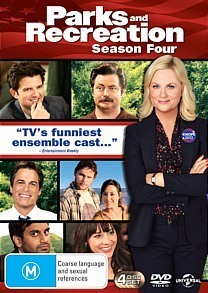 Parks and Recreation Season 4 DVD Review Season 4 is guaranteed to ensure plenty of laughter-fuelled evenings at the homestead. After a shaky beginning in its first season, Parks and Recreation quickly blossomed into one of NBC’s most highly-regarded comedies. Though its ratings haven’t always matched those of some of its thematic forbears such as a certain Steve Carrell vehicle, the show has garnered consistently strong reviews and has built a solid fanbase over the course of its five seasons - none other than Time magazine declared it the best television series of 2012, and a story arc between two of its central characters was described as the year’s greatest love story to boot. The brainchild of Greg Daniels (The Office) and produced by Mike Scully of Simpsons fame, the series revolves around Lesley Knope (SNL’s Amy Poehler), an energetic civil servant who believes her mission in life is to make the town of Pawnee, Indiana a better place. Joining Poehler is one of the strongest ensemble casts to ever feature in a comedy series, including the likes of Rashida Jones (I Love You Man), Adam Scott (Step Brothers), the brilliant Nick Offerman, deadpan comedienne Aubrey Plaza (Funny People) and the inimitable, effortlessly likable Aziz Ansari, possibly the strongest standup comic in the biz right now. Season 4 sees also Rob Lowe returning as freakishly optimistic fitness fanatic Chris Traeger, and finds our heroine running for city council. Helping (and occasionally inadvertently hindering) her in her efforts are Knope’s rag-tag fleet of co-workers at Parks and Rec, and the series largely revolves around her attempts to balance her run for public office with her feelings for on-again off-again beau Ben Wyatt (Scott). In this series Ansari’s character Tom Haverford finally fulfils his dream of becoming a ‘baller’ businessman, starting the enigmatic company Entertainment 720 with his dim-witted party animal besty Jean-Ralphio (played to perfection by Ben Schwarz) and Andy and April (Plaza) continue to be the world’s most unlikely marital success story. It’s another unmissable outing for this inventive and frequently hilarious show. Superb, career-defining performances are bolstered by consistently strong writing and a number of satisfying and meaningful story arcs, and with plenty of bonus content and no less than 22 episodes this time around, Season 4 is guaranteed to ensure plenty of laughter-fuelled evenings at the homestead.